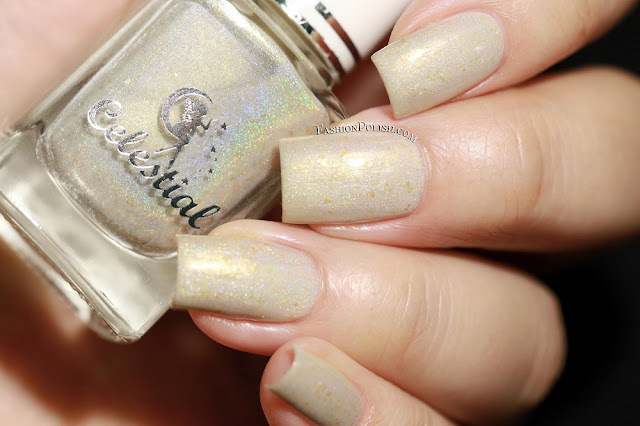 Fashion Polish: Celestial Cosmetics We Breathe the Fire collection & bonus! Celestial Cosmetics We Breathe the Fire collection & bonus! I'm back today with swatches of the Celestial Cosmetics We Breathe the Fire collection. 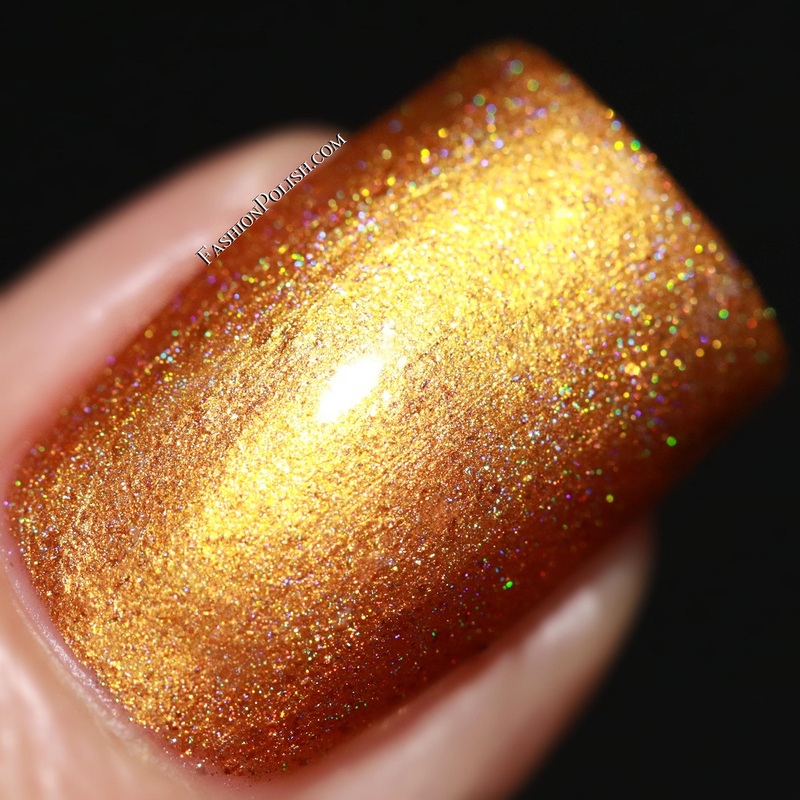 Jarnunvosk is a light gold coloured holo with gold flakes and a gold shimmer. A soft and soothing color. I used coats plus topcoat. 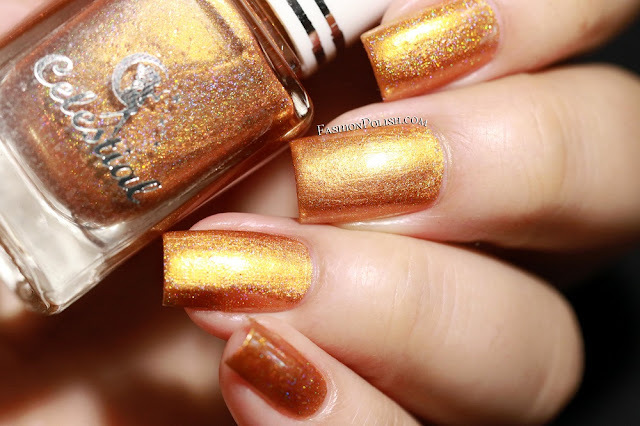 Glaedr is a bronze/copper linear holo with bronze flakes and holo orange micro glitters. A vivid metallic color. I used 2 brushstroke-free coats plus topcoat. 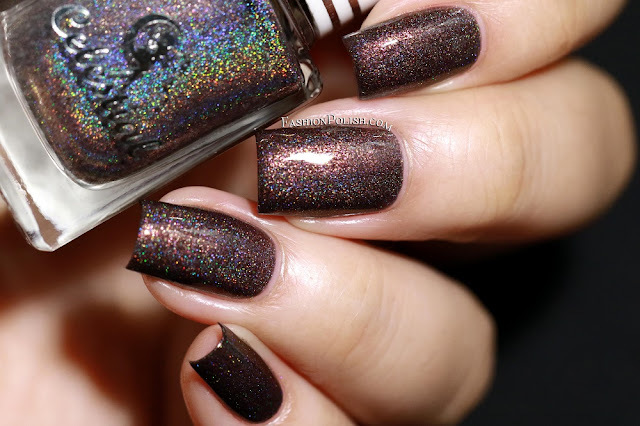 Thorn is a blackened brown linear holo with a mix of matching flakes and sparkles. A vampy color that can be worn all year long. Show below : 2 coats plus topcoat. 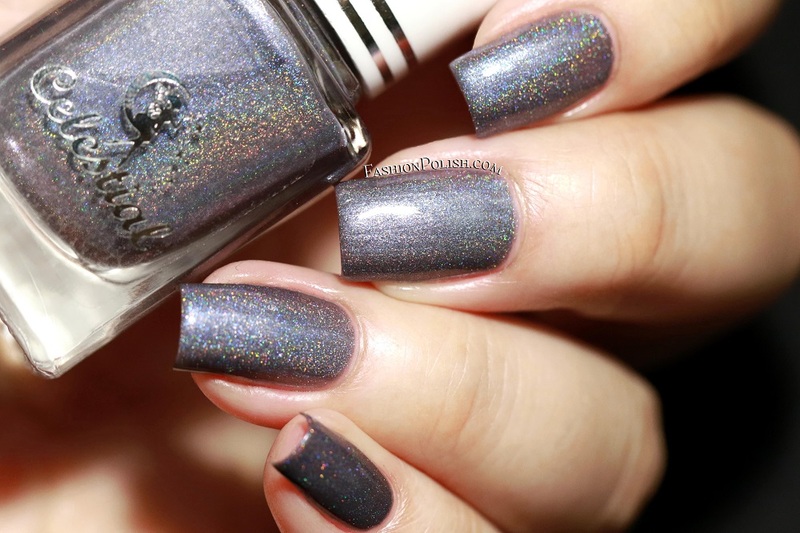 Saphira is a stormy blue linear holo with blue flakes. I don't think I have anything quite like it, I love it! Again, I used 2 coats plus topcoat. Firnen is a green holo pigment with green to gold colour-shifting flakes. A complex and mesmerizing green. I used 2 easy coats plus topcoat. Shruikan is a black based linear holo with green flakes. I love how dark and enigmatic it looks! No surprise here either, 2 coats plus topcoat in my swatches below. Waterlily is a a purple shimmer with a complex mix of purple and gold flakes and microglitters as well as a touch of holo microglitters. It's so packed with particles that it appears a bit gritty on my swatches but I can assure you that it's smooth to the touch after topcoat application. I used 2 coats plus TC. A really nice collection with complex and well formulated colors. My personal favorites are : Saphira, Firnen and Shruikan with a special mention for Jarnunvosk! 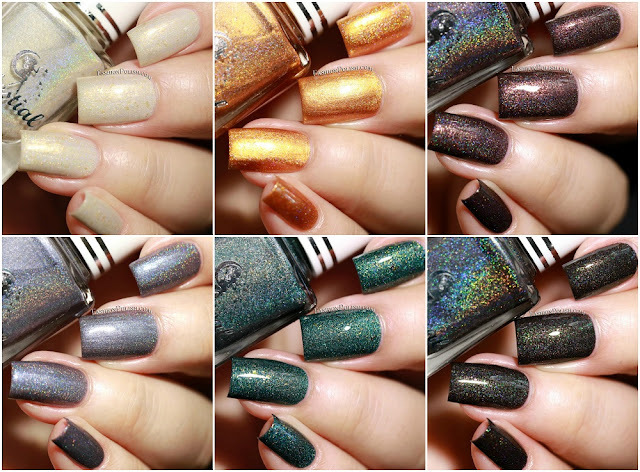 The Celestial Cosmetics We Breathe the Fire collection and Waterlily are available for purchase on Color4Nails.com (international shipping available) and retail for $11 each.